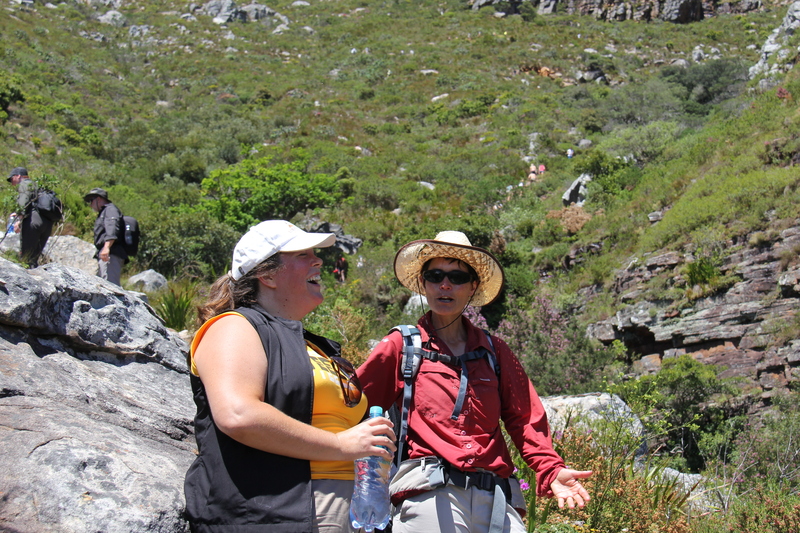 Our hike up Table Mountain was with an experienced guide company called Hike Table Mountain. I recommend this outfit for their communication, assessment of ability, and skills/knowledge. 1. SAFETY. Crime is a fact any place you go, but there are always things we can do to reduce our risk of being a statistic. 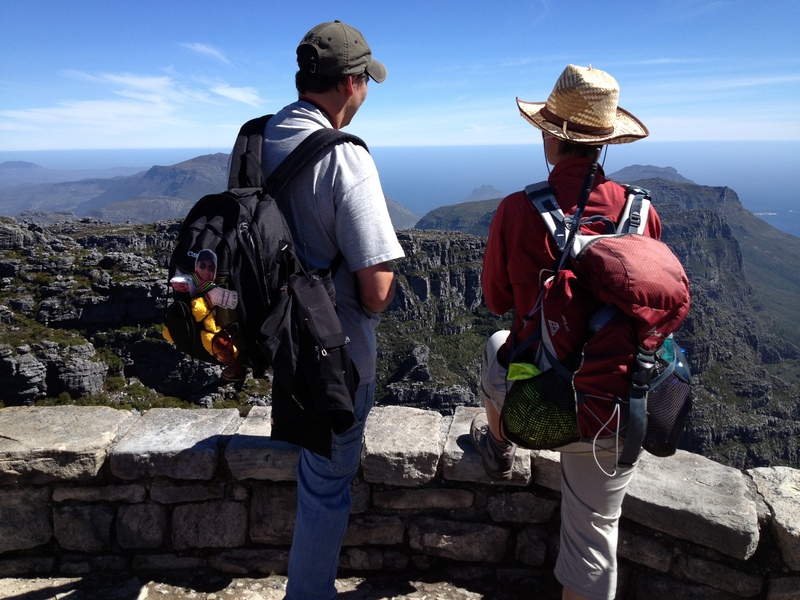 For Table Mountain, strength in numbers and heightened awareness are key to increasing your safety. Whether you hire a guide for a private hike, as we did, or whether you hire a guide to join an existing group hike, you have the safety of quantity, as muggers are less likely to attack a larger group. A good guide also stays current on crime in the area, knowing which routes may have problems, what to watch for and have good contacts in case of emergency. 2. KNOWLEDGE. From helping you choose your route based on your interests (and athletic ability!) to history of the mountain and area, to knowledge of the surrounding vegetation, wildlife and rock formations, a guide can enhance your hike. The above were my main reasons for getting a guide, but you may find additional reasons as well, and I think Hike Table Mountain has a good page outlining those, which you can read via this link. 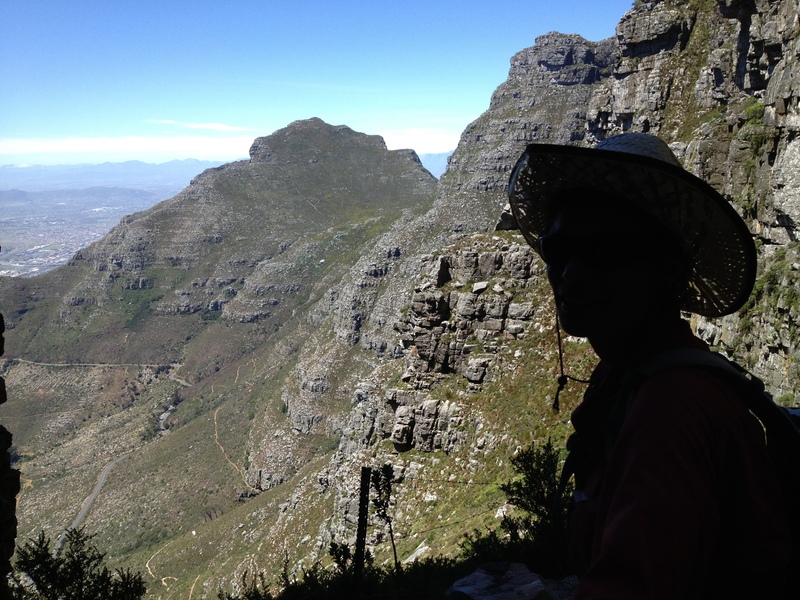 Here is the criteria I used when rating Hike Table Mountain. I will be doing my Trip Advisor assessment today as well, and they will be receiving a five, based on what is important to me: communication; assessment of ability/interest; and skills/knowledge. I was initially worried communication might be an issue with this outfit because I was unable to complete the contact form on their website. I don’t know whether it was an issue with the site or with my browser, but there was a contact email address and phone number on the same page, so I chose to email instead. Riann, the company founder, replied within a couple hours and patiently fielded emails from me over the next several days answering my questions and helping determine which route was best for me. When a date was chosen, despite it being one he was not able to hike himself, he matched us with a guide and made sure we had all necessary mobile numbers. Not everyone has the same athletic ability, nor the same interests with hiking. Riann had me answer a series of questions to help determine both fitness level and sense of adventure. Any guide you consider should go through this with you ahead of time. In answering his questions, Kurt and I realized that we have different tolerance levels for heights (regular readers here can probably guess that my tolerance for heights is much greater, and I’ve never had vertigo in my life.) I also realized that I prefer scrambling to straightforward climbing, because I like the ability to use both my arms and legs in the experience. If I had just picked something based on my desires without considering my fitness level, I would probably be stuck somewhere halfway up a treacherous route. If I had picked something based on just my own sense of adventure, Kurt would probably be stuck somewhere halfway up a dizzying climb. Riann helped me choose a route based on time, ability and on both Kurt’s and my sense of adventure. Our guide, Binny Ridgway, was perfect. As I mentioned yesterday, Kurt and I pack like children sometimes, and we didn’t have enough water and I had left my hat in my suitcase. Binny was ready for underprepared hikers and had come with extra provisions. She knew the mountain well, and as we hiked she would watch for when I needed to catch my breath and use the time to tell us the names of the flowers around us, talk about the geology of the mountains, the wildlife, and of course, entertain us with local folklore. We plied her with questions about her previous tour groups and which other routes were her favorites. I could tell she was watching me closely early in the hike, determining whether or not I could handle the climb. We learned that she has, in fact, had to turn around in the past, but rarely. She paced our climb for my level of ability, and although we took twice as long as average, her patience allowed me to make it all the way to the top. Binny explained about the weather changes on the mountain, and the seasons. Even the most athletic hikers make the mistake of underestimating the mountain, especially the weather. 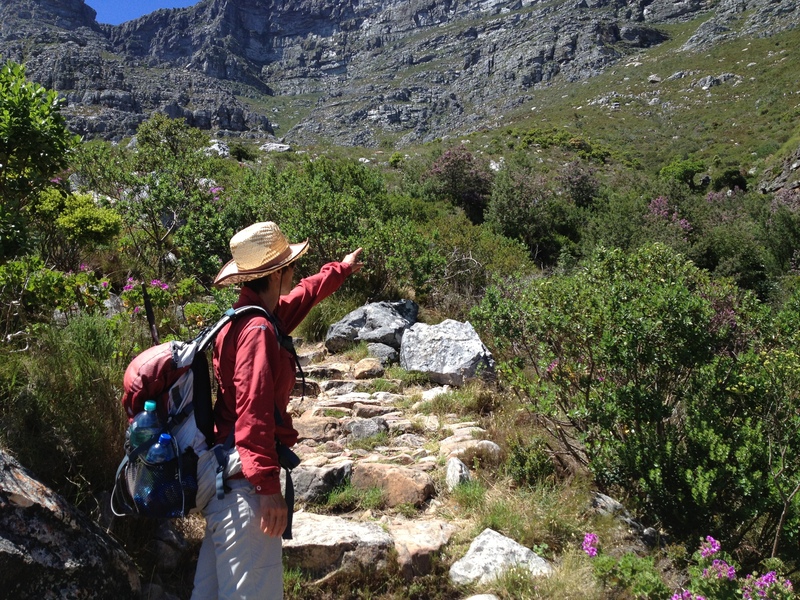 I was going to include a route guide for you as well, but I think Hike Table Mountain has done a pretty good job of creating a route guide, including hike time and ability level for each route. Click here for their route guide, which also includes prices. Expect to pay more if going privately rather than joining up with another group. I personally felt a private guide was a better experience, and I didn’t have the added guilt of being the slowest member holding back a larger group. Rates: *R600-950 per person when traveling with a group (currently around $60-95pp). Expect higher rates when hiring privately. Ours increased by R100pp for a private hike. *Please note this does not include tip. Tip based on your experience with the guide. 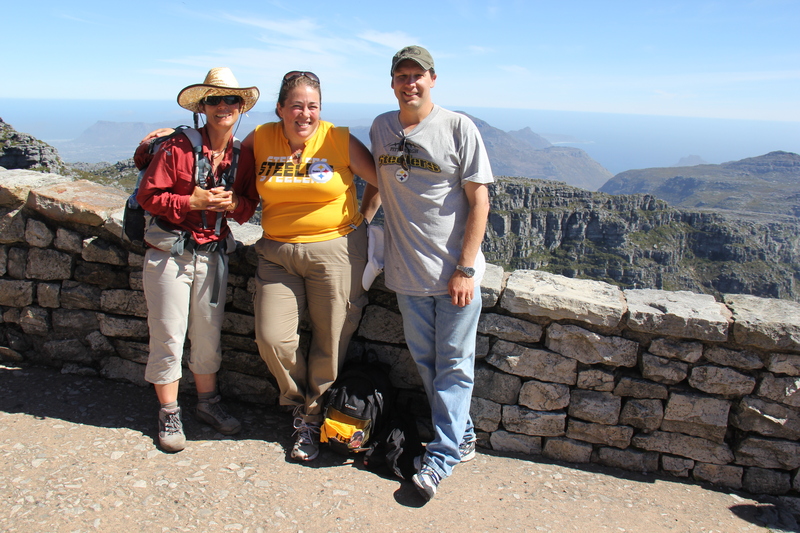 We loved our guide and tipped generously because of the experience she gave us. 1. Stay at a nearby hotel for the night before. Having planned our hotel stays before we planned our excursions, Kurt and I spent our first night at Boulder’s Beach. It meant an extra hour drive before starting the hike. 2. Take a taxi or a hotel car. Give yourself a stress relief. Parking can be a nightmare at Table Mountain, especially during prime times and peak season. Spend a little extra and take a taxi or car, or plan for a very long walk to/from your car both before and after your hike. 3. Avoid the queues. Best option, for the “big spenders”: spring for an annual pass that gets you on and off that aerial tram whenever you like. It will cost you approximately R500 per person (about $50). Second best option, for those on a budget: purchase your aerial ticket online before going. This is a shorter queue, so you have less waiting time than those who buy on-the-spot. The ticket is good for a week from the date you choose, so you have a window of time to catch Table Mountain on a beautiful day. 4. Stop. for. lunch. after the climb! We were so exhausted when we reached the top that the thought of all those crowds in the cafeteria was overwhelming. Instead of sitting down to eat and letting our bodies (and minds!) refresh, we just wanted away from people. So we bought our tickets back down the tram, grabbed water and snacks and got in line to head back down the mountain. And we missed some amazing photography opportunities. The next time we returned to the mountain, it was too cloudy to see anything. Sure, we took a few shots when we got to the top, but we were so “done” that we didn’t spend time exploring the top of the mountain once we were there. We had the most beautiful day for it, and we both agreed that if we had forced ourselves to sit and have lunch (the food is good, the toilets nice and clean) we would have then felt refreshed enough to go take more photos from different parts of the table top. 5. Make time for SUNSET! We kept saying “We’ll go back at sunset” but often by the end of the day we were tired and the thought of another drive and queueing kept us from returning. The one day we decided to do it, it was covered in clouds (although that is a beautiful entirely to itself). Another day we didn’t have the option, because the mountain was closed due to a high wind advisory. They offer sunset rates on the cable car, so take that taxi I mentioned above, and get up on that mountain to enjoy the ocean and sunset in all its glorious splendor! Definitely want to try this!